Feng shui wind chimes are one of the most popular remedies that can be used throughout the home. They can be placed either inside or outside of the home. They use sound to change the 'qi' or energy of the given space. It may either protect an area from 'qi' that moves too fast or help to activate the 'qi' if it's stagnant. Therefore different areas of the home may require the chimes for different purposes. There are so many different types of wind chimes, made out of a number of different materials. The material has special significance in feng shui, they are predominantly used to represent the various elements. You have five elements in feng shui and aside from the element fire, all of the other four elements are represented by wind chimes. This is very important, as it may be related to a particular element in an area of the room or an entire home where that element is lacking. By adding that element, it creates balance among all the elements in the space. Glass chimes are used to symbolize the water element. Bamboo and wood chimes are used to symbolize the wood element. Ceramic chimes are used to symbolize the earth element. Metal is the most commonly represented element, with chimes made from brass, steel, aluminum, iron, bronze and copper. There is certainly another part of feng shui wind chimes that may be significant. Not all of them come with the same quantity of rods. The quantity of rods actually has special meaning. The most common number is five, it is usually preferred, because each rod represents one of the five elements. This type is used primarily to help harmonize an area by showing the balance of these elements. Its other main use is for protection, to ward off bad luck. Six or eight rods are also available, but the meaning is kind of different. These are primarily used to attract or enhance good luck. There happens to be several locations where these special feng shui tools should be placed. 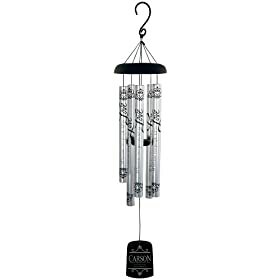 Indoor wind chimes are generally smaller in size and metal is the material that's most often used. Meanwhile garden wind chimes are usually bigger in size and bamboo is the preferred material here. You have a few areas that are not appropriate for this type of tool, sound waves may prove to be too distracting. These include areas where you normally eat, sleep, sit and work. The key here should be to first determine specific locations that needs balancing, protecting or enhancing. Eliminate areas that may actually negatively affect you after which you can choose the appropriate material and quantity of rods for your intended purpose. Feng shui wind chimes uses sound to fight bad luck and attract good luck. They are among the most popular feng shui remedies and can be used almost anywhere with the help of a map bagua.